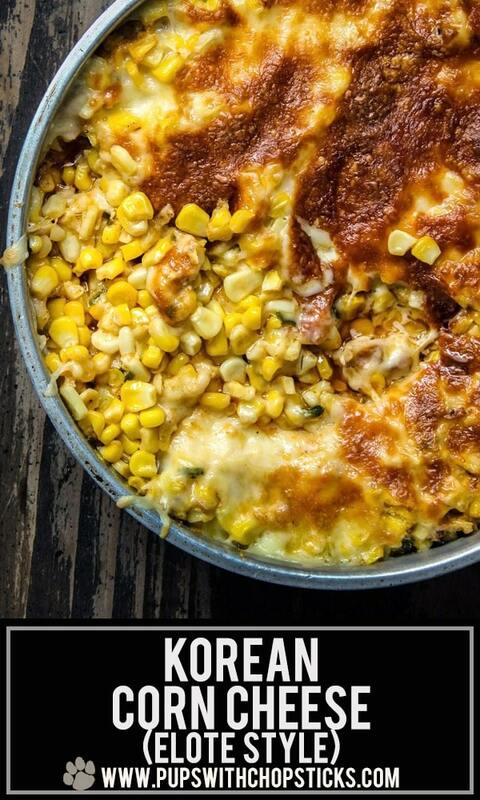 Korean corn cheese is a popular cheesy, sweet and savory snack typically enjoyed with drinks. 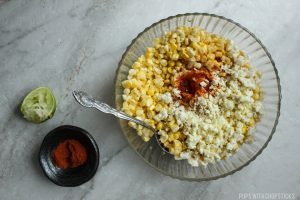 I tinkered around a bit and combined it with the flavours of Elote (Mexican Grilled Corn) for a more flavorful way to enjoy corn this summer. 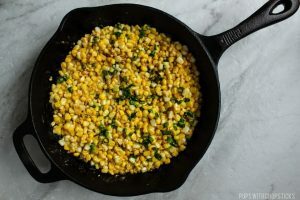 When I lived in the city, I grew up on canned corn and I thought it was the most fantastic vegetable ever made – partially because it was super sweet but mostly because it was swimming in an sugary sweet syrup which I used to love drowning my rice in. As I grew into my teenage years, I was a bit more curious about food and I ventured onto corn on the cob from the supermarket and I was hugely disappointed, it wasn’t sweet like the canned corn and definitely not as flavorful so it was back to canned corn for me. My adventures in corn didn’t end there. My dad took us out of town a lot on the weekends and I started to notice people selling corn on the side of the road in their trucks. Before that, I had the notion that food just magically appeared via food fairies in supermarkets to be bought and had no idea that farmers existed – boy was that an eye opener for me. Mom and dad bought some corn from the farmer and served it for dinner that night, and holy moly bejebus that was the best corn I have ever tasted – this stuff was sweeter than candy. I never turned back to canned corn since. 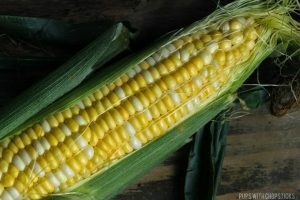 Now that I live closer the the farms, I do like to buy my corn locally at the farms and it’s something that I almost always have in the summer time so I like to get creative with it and have it many different ways. 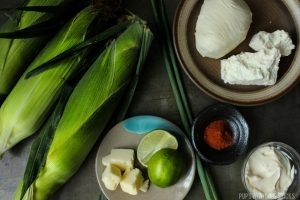 One of my favorite ways to enjoy it is to have it Mexican elote style – Grilled with cotija cheese, mayo and lime with a bit of cayenne. 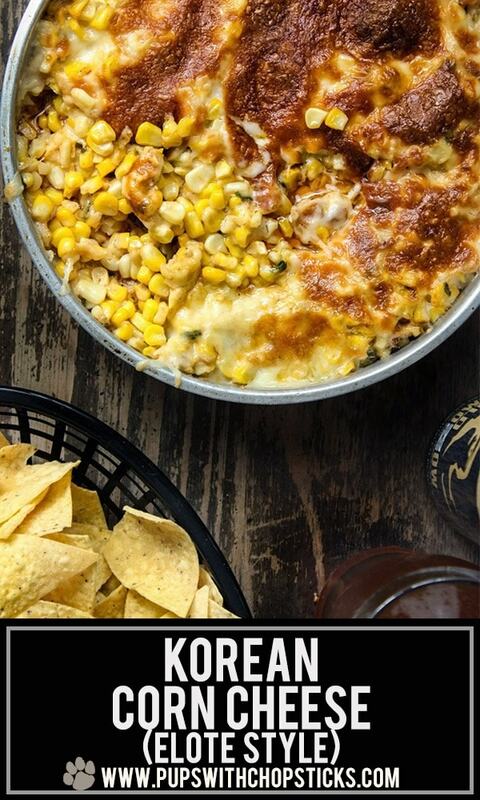 So when I discovered Korean corn cheese I was intrigued. 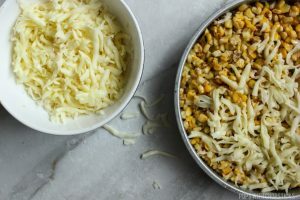 Another way to make my favorite dish even MORE cheesier? I won’t fight that. This recipe is definitely not for the faint of heart. It is super heavy and greasy but it was meant to be a snack for drinking so it makes sense! 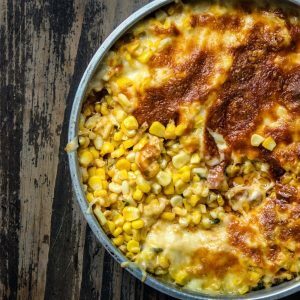 For this corn cheese, recipe, almost all these ingredients can be found at your local grocery store. If you can’t find cotija cheese, which you can typically find at a Latin supermarket – you can substitute feta in it’s place in a pinch. 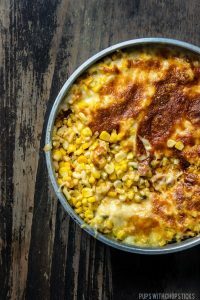 I used fresh corn for this recipe, however you can use canned corn if you’re in a hurry. Just remember to drain out the sugar syrup before using it. 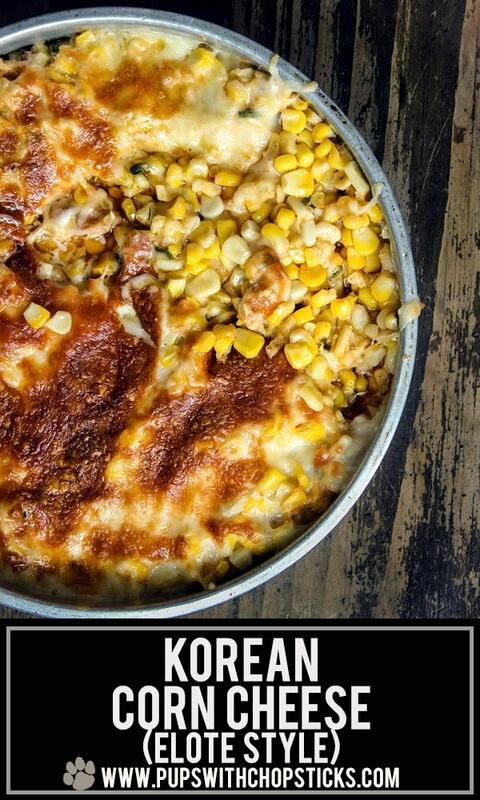 Traditionally, Korean corn cheese has sugar in it. I did not add sugar to this recipe, since the corn I get is super duper sweet already and didn’t need the added sugar. Make sure to taste the corn and decide if you need the additional sugar. If you find that the corn you have is not very sweet or flavorful, you can add 2 teaspoons of sugar to the recipe. I definitely do not recommend adding in more sugar if you are using canned corn, since it is usually already very sweet. I tried both methods and to be honest – I didn’t notice a major difference. 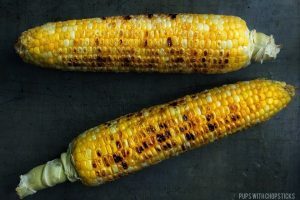 Mind you, I didn’t char my corn til it was black but if you have the time I highly recommend trying both ways to find your favorite. No Waste Here, Save the Cobs! I like the freeze the cobs for when I want to make a soup. When you are feeling like a soup one day, just throw in the cobs and boil it for 30 minutes and then discard the cob afterwards – it will give your soup a boost in corn flavour! Just when I thought veggies were supposed to be healthy – this happens. A popular Korean corn cheese snack that’s cheesy, sweet & savoury combined with the flavours of Elote (Mexican Grilled Corn) spice & tang. (Optional) 2 teaspoon of sugar – only if the corn is not sweet on it’s own. Set the stove to medium heat and melt the butter in a pan. Turn off the heat and add in the green onions and mix together. Broil for 3-5 minutes or until the cheese has melted at the top and is brown. Taste the corn and decide if it is sweet it enough for you. Only use sugar if your corn is not sweet. Do not use it if you are using canned corn since the canned corn is usually soaking in a sugar syrup and is already very sweet. 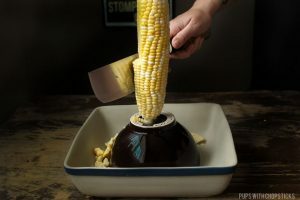 I never cut the corn all the way down that it would hit the knife to the bowl 😛 but you can always use plastic or wooden bowl if you have that as well! This is my favourite dish because I love corn and cheese, not all cheeses I like, but the one you selected is my kind of tea, when mingling all up —- Oh, so delicious!. Thank you. I love all cheeses 😀 Especially melty ones. Oh, that loos so delicious. I am so glad corn is in season! WOW! This is amazing. I love cheese heavy snacks. 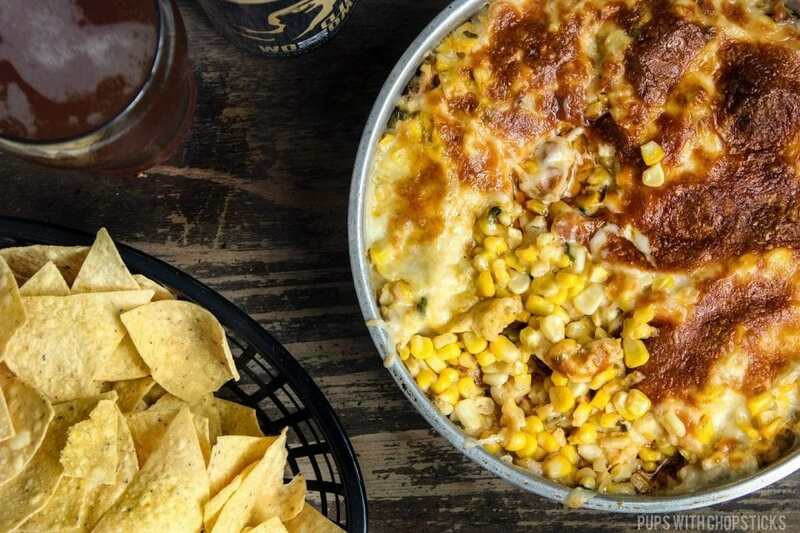 I love the idea of corn and cheese together. I will be making it soon. I’m a SUPER big fan of corn ALL the ways. Also cheese. 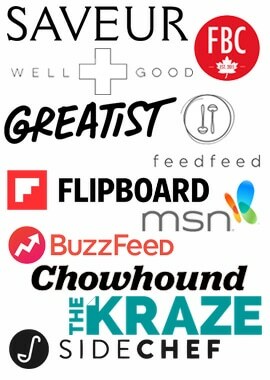 Also cheese all the ways. 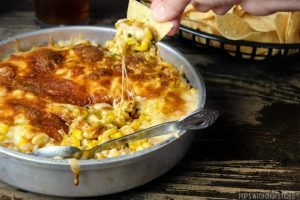 So there’s no way this skillet of corn and cheesy goodness is not delicious! I’m so glad you finally got to experience “real” corn! This looks like a fantastic dip for cocktail hour! Definitely giving this one a try! I know right? I was missing out!